The books are dusty, crumbling, their spines too fragile to touch. My grandmother’s house yields steadily diminishing quantities of books that represented a library: each year, their numbers are eroded by termites, old age, white ants, damp and marauding grand-daughters. I imagine that this is a situation replicated in most of the dusty, crumbling mansions of Calcutta, as those ‘bhadralok’ libraries are disassembled, sometimes replicated elsewhere, sometimes forgotten. To him, they represented “the ugliness of British India”; to present-day residents of Calcutta, they represent an era of graciousness and expansiveness now facing the bulldozer, old red brick and white plastered houses transmuting into block upon block of lookalike flats. What he loved about the city was that it returned him to his language, Bengali, the tongue he preferred to speak in, though his books were written in English and his lecture tours in the US were conducted, naturally, in the same language. It is not easy to read Dhan Gopal Mukherji today; unlike other writers of his time (he was born in 1890 and died in 1936) he has not dated especially well. Books that once moved American critics to rhapsodies, such as Caste and Outcast, are all but forgotten. But the reason I’m reading him has to do with a comment made by Amitava Kumar in ‘Longing and Belonging’, his introduction to ‘Away’, an anthology of expatriate literature. Kumar was probably wise to omit Mukherji from his list of anthologised expat writers, but when you speak of writers who ’embody travel’, it’s impossible not to think of Mukherji. [He does precisely that, setting down a reverse travelogue that turns into a spiritual exploration of the land he had departed from, with a running internal battle between stories from the West and from the East. Mukherji was not an especially original thinker. His suspicion of Muslims (and Marwaris) was drawn from Bankimchandra; his views were borrowed from all over the place; his spiritual narrative reads like a thousand other tales of worship and mysticism. If he is remembered at all today, it’s for his children’s stories, and for an outraged response to Katherine Mayo. In the annals of the Newberry Medal, one of the most prestigious awards for children’s writing, the only Indian name on the rolls is that of Dhan Gopal Mukherji. He wrote several books — Kari the Elephant, Hari the Jungle Lad — but the one that is still read today, thanks to the Newberry, is Gay-Neck: The Story of a Pigeon. Like many books of the time, it is far less sanitised and far more curious than Disneylit: its feathered protagonist is shot, badly injured, and near death, but recovers and goes on several adventures. 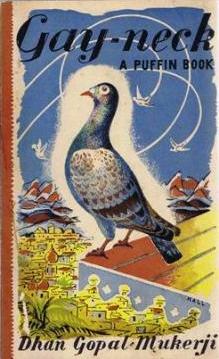 Gay-Neck, a trained carrier-pigeon, wanders the Himalayas before being employed by a Bengal Regiment to carry messages back and forth during the First World War in France. Through his narrative, we get an idea of Mukherji’s sense of his country and of foreign lands. When Katherine Mayo’s “drain-inspector’s report”, Mother India, came out and horrified any self-respecting Indian with its farrago of half-digested nonsense, Mukherji was first off the mark. He wrote a spirited riposte, titled A Son of Mother India Answers, which anticipated the criticism that Mother India would continue to gather over the years. Like many expatriates, Mukherji’s relationship with the language he wrote in was deeply troubled. He used English well enough, but it was donned like a suit of Western clothes and thrown off gladly for Bengali, which he felt was more picturesque, more lyrical. His sister felt similarly: she read a story about a dead man’s ghost, a young prince and an old fool. “Is it right to tell a mother that she is unchaste, and all because of the idle talkativeness of a good-for-nothing spirit?” she asks her brother. “That tale destroyed all my ambition to know English.” And thus, comments Mukherji drily, did they dispose of Hamlet. 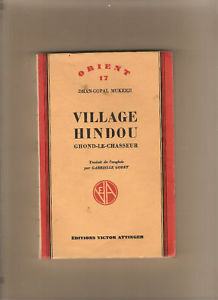 And one of his anecdotes should be required reading for all expatriate writers struggling to ‘translate’ their country for the benefit of foreign readers. He and an old lady of seventy are recalling the songs of the palanquin bearers. She recites in Bengali: “Heavy, heavy “” / Heavy, heavy, heavy;/ He ate “” too much./ My shoulder, my shoulder “” / It aches, it aches.” Mukherji expostulates that the English rendering is more beautiful. Mukherji’s story didn’t end well. Despite his celebrity in the West — there were very few Indian authors at the time, unlike the present, when you can’t move in literary circles without falling over yet another exported desi — his spiritual quest appeared to have failed. His books — he wrote 26 all told — weren’t selling as well in the 1930s as they had in earlier decades. He had become a recluse in his forties, and was given to fits of intense depression. In 1931, Dhan Gopal Mukherji committed suicide; but he has left at least one indelible claim on literary historians. Indian authors have won the Booker, the Nobel, the Pulitzer. Seventy- six years have elapsed since a Bengali immigrant to the US won the Newberry Medal, but no other Indian has claimed Dhan Gopal Mukherji’s trophy again.